“Seattle Mariners have indicated winter priorities to others: No. 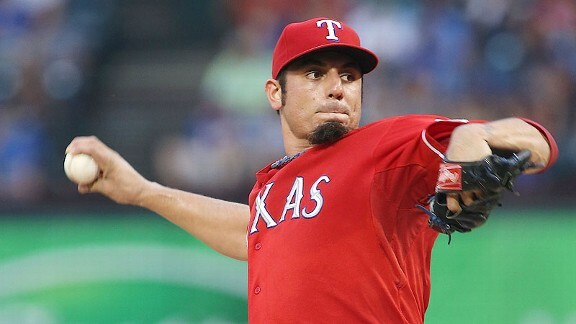 2-type starting pitcher (Garza? ), closer and two frontline power hitters.” —Buster Olney at ESPN. That sounds like Kendrys Morales and Nelson Cruz unless they remember that defense helps to stop runs, too. Also, No. 2 pitchers turning into No.5s? Sounds like Hisashi Iwakuma isn’t seen as a legitimate No. 2, unless they see him as the No.1 and want to slot someone ahead of Felix Hernandez. Did they not notice his Cy Young nomination? And they must have money to burn if they want to buy a free agent closer. Baltimore Orioles fan favorite outfielder Nate McLouth has enjoyed a career resurrection at Camden Yards. His scrappy defensive style, ability to get on base and occasional flashes of power made him a staple on Buck Showalter’s line-up card. McLouth established himself in the mid-2000’s in Pittsburgh, winning a Gold Glove in 2008 and appearing in the All-Star game for the Pirates. Injuries forced him through the farm systems of the Braves and the Orioles. He got a chance in the majors again when the Orioles scooped him up to play left and platoon against right-handed power pitchers. Jason Vargas, Age: 30, 2012-13 stats: 23-19, 3.92 ERA in 57 starts, 1.26 WHIP, 6.13 K/9, Most recent contract: Made $8.5 million last season after being traded to Angels in offseason. Vargas suffered a blood clot that kept him sidelined nearly two months this season. Despite the tough blow in a contract year, he managed to go 9-8 with a 4.02 ERA and 1.39 WHIP for the Angels. But what Vargas did his previous three seasons is what should impress suitors. It should be, it seems, a simple matter for clubs to set their rosters to prevent losing players they wish to retain next month in the Rule 5 Draft, which occurs December 12 at the Winter Meetings in Orlando, Florida. The devil is in the details, which each club must iron out before the deadline at 11 p.m. Central time Wednesday. Prospects eligible for the draft must be protected — i.e. added to the 40-man roster — before that time to prevent their possible selection. Protection comes often at the expense of players already on the roster. Prospects become draft eligible after four or five pro seasons: Four years for players who are 19 or older when they sign their first pro contract; five years for those younger than 19. After Wednesday, clubs can continue to add major-league free agents to their roster, even if it requires a corresponding space-clearing move but are prohibited from adding any player from their minor-league system. Despite a snag in the efforts to reach agreement on a new posting system, Masahiro Tanaka should still be available as one of this winter’s top free-agent prizes. For a moment in Orlando, it appeared as though the age-old dispute between small-market and large-market clubs — including a heated argument between Yankees president Randy Levine and Pirates CEO Frank Coonelly — could stall one of the Yankees’ biggest offseason plans. The Daily News has learned, however, that the issue between MLB’s own clubs was a moot point all along because of a refusal by the MLB Players Association to make any changes to the Basic Agreement. Both the Japanese posting system and the international spending cap are part of the Basic Agreement between MLB and the union. MLB’s COO Rob Manfred informed the entire group that he had already discussed the issue with the players’ union, which said there was no way it would reopen the Basic Agreement, leaving the matter to be dealt with when the current CBA expires after the 2016 season. At that point, commissioner Bud Selig stepped in and tabled the discussion.